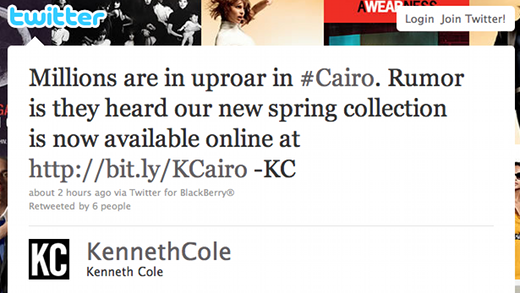 Oh dear, we thought that big brands might have learnt that hijacking hashtags isn’t a good idea and yet here’s US fashion brand Kenneth Cole, hijacking the #Cairo hashtag (currently used to report from the troubled events in Egypt) to promote its new Spring collection. Need we remind you, Kenneth Cole, that people are dying on the streets of Cairo as they fight for their beliefs? It’s quite shocking to see a brand act like this in 2011. Almost two years ago, UK retailer Habitat set the textbook case study for hijacking popular hashtags with wholly inappropriate promotional messages, including the protests in Iran at the time. The company eventually apologized after bloggers and the Twittersphere quite rightfully reacted with shock to the tweets. Maybe in Kenneth Cole’s case today, it was a poorly trained employee thinking that they could maximise their audience by tweeting using a popular hashtag (in a quite a creative way, it has to be said). Many others around Twitter don’t agree. That said, it was signed “KC”, so maybe Kenneth himself sent it? To be fair, Kenneth Cole’s Twitter account then apologised for the tweet, saying that “We weren’t intending to make light of a serious situation. We understand the sensitivity of this historic moment”. We’re still surprised that some brands aren’t savvy enough yet to know that it’s a bad idea to hijack hashtags in the first place. For more social media fails, this is absolutely worth checking out from Jeremiah Owyang. Kenneth Cole has now removed the tweet and issued an apology, doesn’t look like many have accepted it.